We’ve had a number of people come to this review and knock it as being a waste of space and pointless because we compared an aftermarket GeForce GTX 1070 versus a reference Radeon RX Vega 56. We deleted some of the hate filled comments that were putting us down and went back and grabbed out NVIDIA GeForce GTX 1070 FE cards from the pile and ran some benchmarks on it. So, let’s look at the arguments! 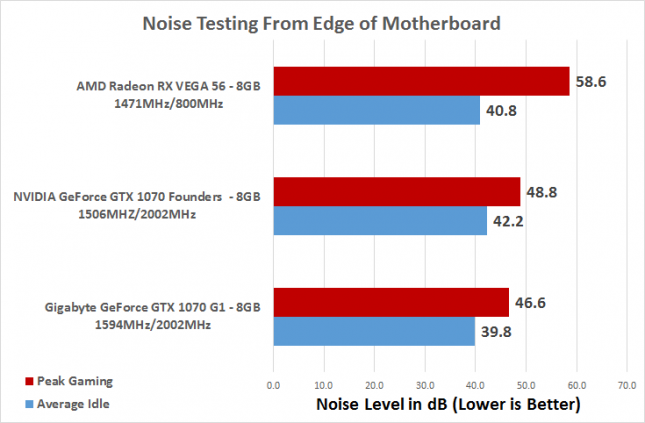 Our testing of the GeForce GTX 1070 FE with a blower style fan had it nearly 10dB lower than the Vega 56 reference card. The NVIDIA GeForce GTX 1070 FE easily wins when it comes to blower versus blower performance against the Vega 56. That is 100% true, but on our open air test system in a nicely air conditioned room the difference wasn’t massive. 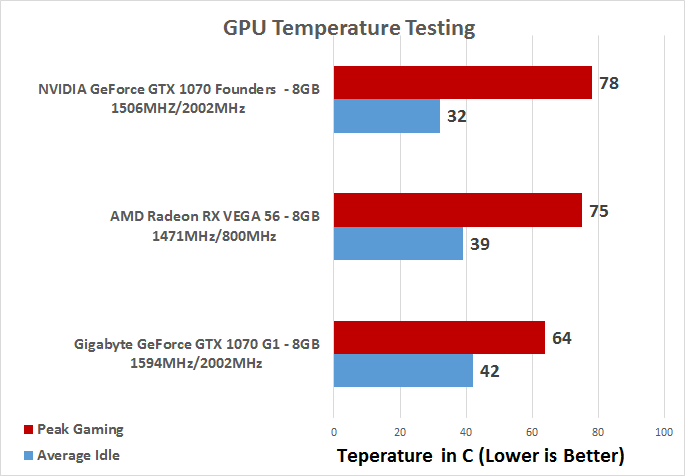 The GeForce GTX 1070 FE has the lowest temp at idle since the Gigabyte cards fans don’t spin at idle. So, the GTX 1070 FE has higher fan noise at idle, but is 7C cooler. At load there is only a 3C difference, but the Vega 56 is almost 10dB louder. That is true when they are factory overclocked like most are, but you are talking about a 2% difference here. If you want to know how a stock GeForce GTX 1070 FE performs you can mentally just take ~2% off the Gigabtye GeForce GTX 1070 G1 Gaming numbers and that will get you in the ball park. 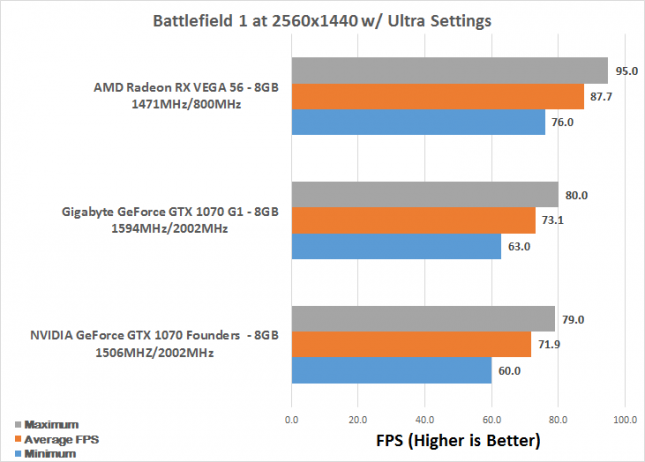 An 88MHz overclock on a GeForce GTX 1070 isn’t going to drastically increase performance. 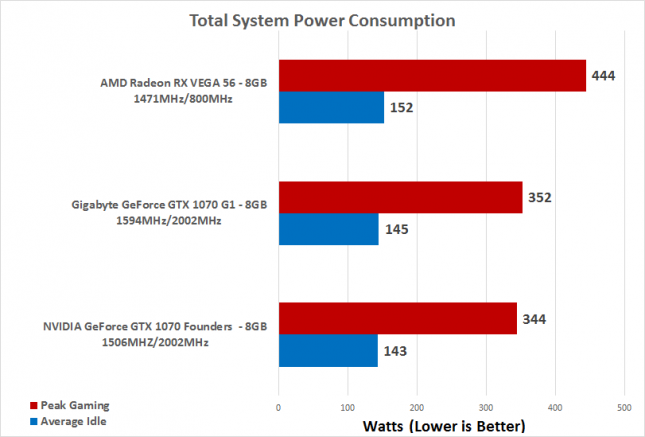 Oh and something else to factor in is power is lower on the reference card since it runs at lower clock speeds and has fewer fans. 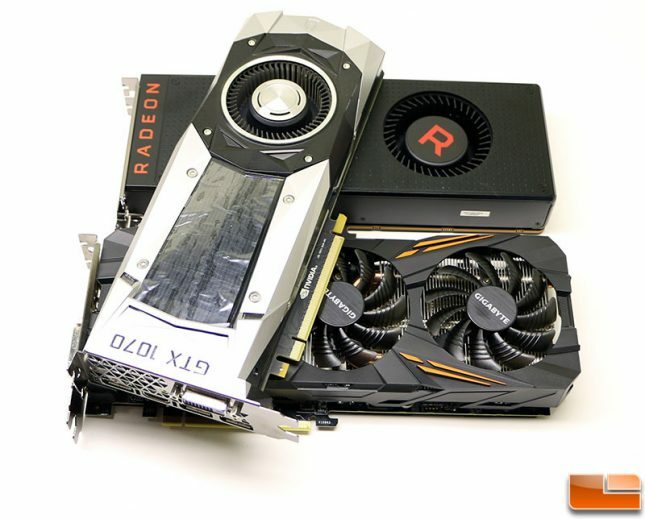 The AMD Radeon RX Vega 56 reference card uses more than 100 Watts than the NVIDIA GeForce GTX 1070 FE ‘reference card’. Thanks for the hate, but with either a GeForce GTX 1070 reference card or an aftermarket GTX1070 video card the overall conclusion is pretty much the same.